The latest attack suffered by Egypt's Christians on their freedom to worship occured late last month in the village of Merinab, in Aswan, where Muslim villagers attempted to block renovations underway at a Christian church. They claimed that the building was a "guesthouse" that cannot be turned into a church. Among the demands called for by the demonstrators was that Aswan governor, Mustafa El-Sayed, resign after he attempted to justify the attack on the Merinab church. 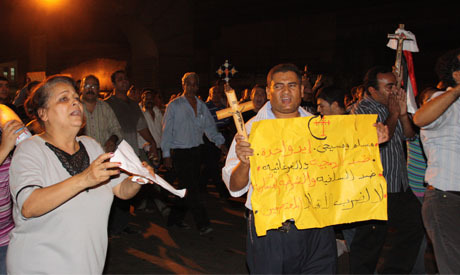 The increasing attacks against Copts in recent months and the lack of protection afforded them by the army have been cited as evidence of latent persecution against Egypt's Christians. The interim government's stalling added to the anger of demonstrators, who demanded to know why Essam Sharaf's Cabinet has refused, or failed, to introduce an anti-discrimination law promised last May. The draft for a unified building code for Muslims and Christians has also not been ratified. Another protester from Shubra, Lotfy Mikhael, insisted that the situation has continued to deteriorate since the revolution began. The protest was mostly peaceful for the first hour, with protesters at one point creating a human cross in the middle of the Shubra Road. However, as the march approached the Shubra tunnel, several protesters burned a picture of Field Marshal Mohamed Hussein Tantawi amid whistles and cheers. The situation quickly turned violent as they came under attack from a hail of stones from assailants standing over them. Later in the night, the army used tear gas to disperse the remaining protesters at Maspero, with more rocks thrown down from the 6 October Bridge by police and armed forces. Security forces chased any protesters who had congregated on the bridge away from Maspero with tear gas cannisters hailing down throughout. Our correspondent reports seeing one protester shot in the shoulder with live round casings litter the ground. Local residents in the Bulaq district of Cairo took part in the attack on the protest, brandishing weapons and throwing rocks at demonstrators, whom they accused of being "troublemakers." According to one of our correspondents on the scene, "It looks like the Bulaq 'thugs' are taking charge now, the security forces have let them." Immediately after filing over the phone, the same correspondent was set upon by an angry mob, accusing him of being a spy. This honest AHRAM report is published in its English digital only! Very smart regime. As Muslims we are told to uphold injustice and to be fair to all. I appeal to the Grand Mufti and all other Muslims beware you will be questioned on Resurrection Day for your injustices. STOP THE LIE You can see the video in youtube and read news before. The Christian attacked the Egyptian Military Supreme Council where they were protecting some institution and christian halogens stated it. Also high priest acknowledge that but he say some group not part of them caused it. Copts were used to be treated all above fellow muslim egyptians as they were protected by the late dictator to gain support from the west. He never jailed , nor tortured, nor even criminally prosecuted any one of them. At a time, he even let go a priest who was criminally charged. What they are trying to do lately to show themselves as victims, oppressed are bare from reality. From my opinion, they are using all this senarios to show themselves as victims, will not let them gain anything to the contrary they will loose all credibilty and sympathy from the ordinary fellow moslems. We were always one family and never thought of them to be foreigner. But now everbody is questionning himself how we should react in the near future. God Bless and keep the Holy Saints in Egypt in his precious hands. May He change the hearts of the Muslim majority to treat all people as equal. Praying for fellow christians struggling for personal and civil rights in egypt.